A well-structured and comprehensive series of ten lectures on the development and significance of Ancient Egyptian pyramids from the step pyramids of the 3rd Dynasty, to the smooth sided pyramids of the later Old Kingdom and Middle Kingdom, and on. 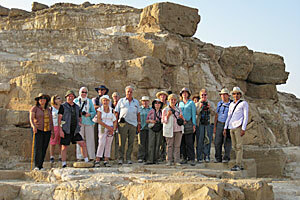 Taught by Dr Stephen Harvey, a much-respected Egyptologist and archaeologist. 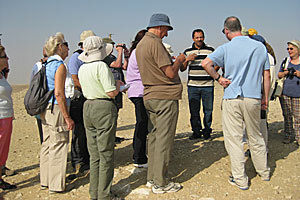 A carefully-considered programme of site visits to complement the lecture programme. 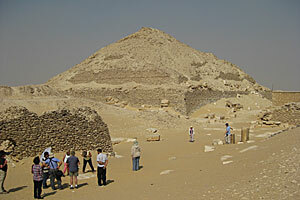 An unusually large number of visits to sites usually closed to visitors: inside Djoser’s Step Pyramid, inside the Sphinx Enclosure at Giza, Abu Roash, Abusir, Abu Ghurab, South Saqqara, Mastabat el-Pharaon, Middle Kingdom pyramids at Dahshur, and Lisht. The Course Coordinator accompanying the group throughout will be BSS Deputy Director Lucia Gahlin. Our organiser in Egypt is Galal Alsenusy who has been responsible for the successful organisation of all 5 of our BSS in Egypt courses/tours to date. Long, exciting days with lectures and relaxation in the comfort of 5* hotels. 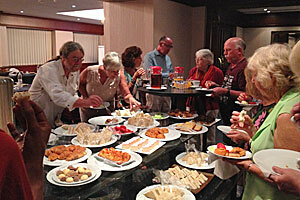 Plenty of time to socialise with Stephen Harvey and fellow participants. 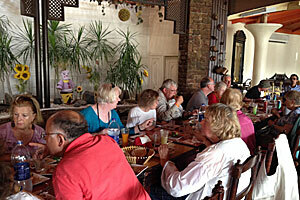 Ten group meals included in the price of the course. Not many people get the opportunity to get this close to the Sphinx! 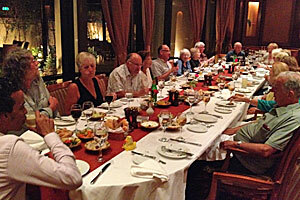 Our farewell dinner at the Meridien Heliopolis was a grand affair! 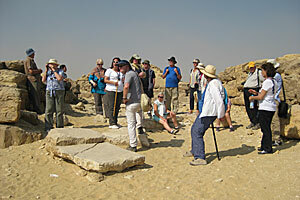 Dr Stephen Harvey taught our sell-out BSS in Egypt course on Abydos in 2012. He has been Director of the Ahmose and Tetisheri Project since 1993, excavating the monumental complex of King Ahmose at Abydos. This will be a unique opportunity to hear this distinguished Egyptologist give a week of lectures in Egypt on the fascinating subject of pyramids. Fly from Heathrow to Cairo. Check in to 5* Le Méridien Pyramids Hotel in Giza for 6 nights. 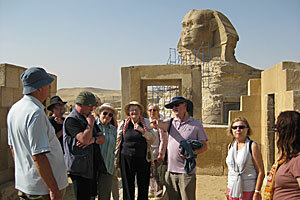 Visit Saqqara including Imhotep Museum, Serapeum, mastaba tombs of Ti and Ptahhotep, and inside Djoser’s Step Pyramid. 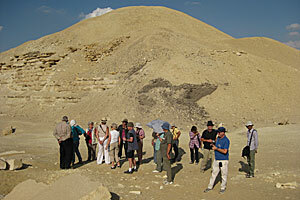 Lecture 1: Pyramid Origins: Stairway to Heaven, Rays of the Sun, Mound of Creation. Visit Sneferu’s pyramid complex at Meidum including mastaba 17 and exteriors of mastabas of Rahotep and Nefermaat; Sneferu’s pyramid complexes (‘Bent’ and ‘Red’) at Dahshur. 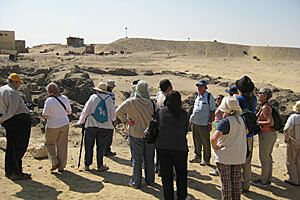 Lecture 2: Upwards and Outwards: Imhotep and Changing Ideas of What a Royal Tomb Should Be. Lecture 3: Creative Genius in the Reign of Sneferu: Dahshur and Meidum. Visit Giza including all 3 pyramid complexes, Solar Boat Museum, inside Great Pyramid, mastaba of Meresankh, inside Sphinx Enclosure; Djedefra’s pyramid complex at Abu Roash. Lecture 4: Metropolis of the Dead: Giza as a Mirror of Egyptian Society. 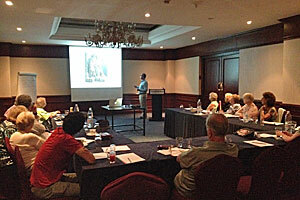 Lecture 5: Ships, Boats, and Transport in the Royal Mortuary Complexes. Visit Saqqara again including exterior of pyramids of Userkaf and Unas, inside pyramid of Teti, mastaba tombs of Kagemni, Mereruka, the ‘Two Brothers’ Niankhkhnum & Khnumhotep, the ‘Butcher’ Irukaptah and the ‘Birds’ Neferherenptah, New Kingdom tombs of Horemheb, Maya and Tia. 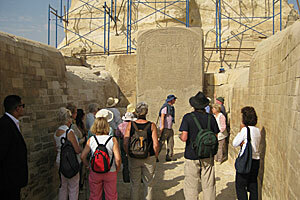 Lecture 6: Relief, Ritual, and Performance in the Old Kingdom Pyramid Complex. 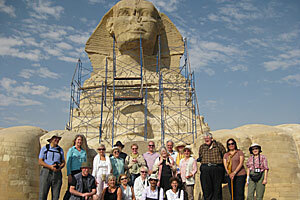 Lecture 7: King Tut's Pyramids: Ancient Visitors, Lion Hunters, and Artists. 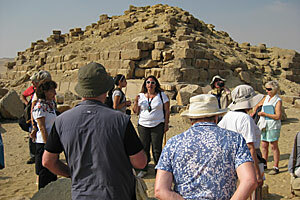 Visit the mastaba of Ptahshepses and 5th dynasty pyramid complexes at Abusir; Niuserra’s sun temple at Abu Ghurab. Lecture 8: Abusir: The Construction and Organization of Royal Monuments for Eternity. Lecture 9: Pyramid Traditions and Transformations in the Middle Kingdom. Visit 6th dynasty pyramid complexes at South Saqqara and Shepseskaf’s Mastabat el-Pharaon; Middle Kingdom pyramids of Amenhemhat III (‘Black Pyramid’) & Senwosret III at Dahshur. Check in to 5* Helnan Auberge Faiyum Hotel on Lake Karoun for 1 night. Lecture 10: Everybody's Pyramids: The End of the Royal Tradition. 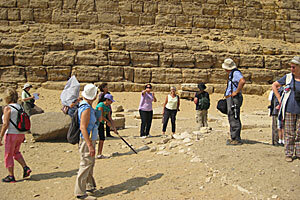 Visit 12th dynasty pyramid complexes at Lisht, Lahun and Hawara. Lunch included. 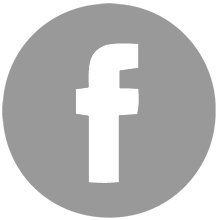 Check in to 5* Le Méridien Heliopolis Hotel for 1 night. Fly from Cairo to Heathrow.